2012 is well on its way, and its climax will now doubt be the conclusion of the current Mayan calendar cycle on the Winter Solstice in December. People worldwide are eagerly anticipating this cosmic event in hope for a positive conscious shift on our planet. Major changes on a global scale have already profoundly changed our lives over the last three years (e.g. the banking crisis, recession, major natural disasters like the Japanese earthquake), and we may be wondering now what else we can expect for the remaining months this year. The numerical year card for us all (based on the calendar year 2012) is trump no. 5, The Hierophant. 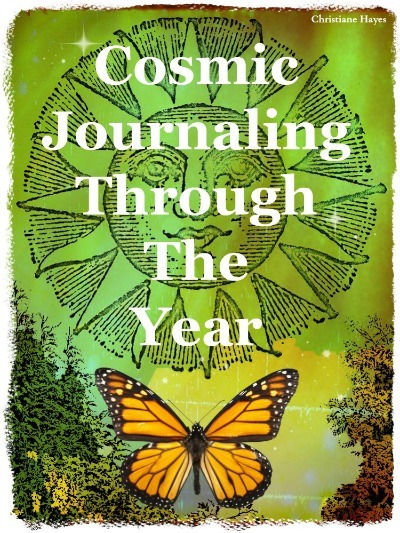 Year cards can give us an indication as to what we need to pay attention to in that particular year as well as what opportunities and challenges we may be facing. The general key words for the Hierophant are: religion, structures and organisations, institutions, rules, ethics, morality, establishment, tradition, education, hierarchy, conformity. Darker meanings of this card: control, rigid regulations and belief systems that don't allow creativity or individuality, religious fanatism and oppression, lack of spirituality. The Hierophant is associated with the zodiac sign Taurus and the element Earth. 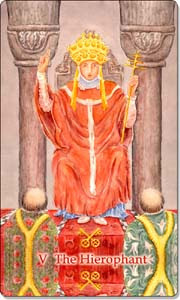 The image shows a papal figure seated on a throne with his feet on the ground and his hands raised into the air, suggesting that the Hierophant is grounded in structure and tradition, yet spiritually connected to the Higher Force above. On a global level, the Hierophant may ask us to turn our backs on excessive materialism, develop a more sustainable lifestyle and thus rediscovering our spirituality. What is the Hierophant asking you as an individual to focus on this year? pay more attention to your spiritual needs; for too long people have focused on their physical (material) and intellectual (scientific) needs, but the human being consists of body, mind and spirit, which all need to be equally nurtured. question the status quo, e.g. in your workplace, in society or in your relationships with others. Lack of change and innovation can lead to a stale environment and situation, where creativity is suppressed and your potential stifled. Think carefully what outdated structures, rules and moral obligations are holding you back. equally feel the urge to introduce more traditional customs into your life; are you thinking about getting married and "settle down"? Or perhaps you would like to get involved more formally in political or social organisations and activities, where you can contribute positively to society. Consider the wisdom found in all religions and focus on the one closest to your heart; observe its festivals and traditions, simplify your life; live according to the core values of religion and spirituality: love, compassion, tolerance, sharing, helping and caring. Take a moment to study the card and explore your individual opportunities and challenges for this year. You can also calculate your personal year card and explore how that relates to how your year has been progressing so far.